If you are looking to go wireless on your Xbox, then definitely check out the Xbox Wireless N Adapter. 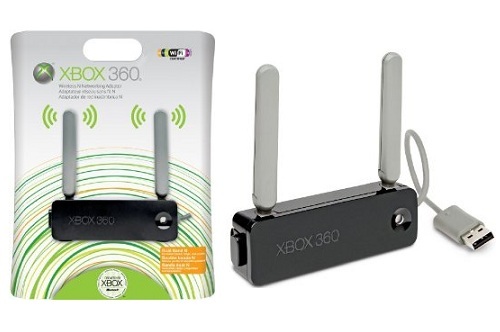 With increased speed, range and wireless security features*, the Xbox 360 Wireless ‘N’ Networking Adapter offers the fastest and most convenient connection to Xbox LIVE. You can seamlessly download or stream HD movies, TV episodes, and games from Xbox LIVE Marketplace in full 1080p and 5.1 surround sound from anywhere in the house. ** Compatible with A/B/G/N networks, the compact design clips easily onto the back of your console, a very nice feature to keep things clean and uncluttered around your console, or offers the flexibility of off-board placement. Package includes: Assembly instructions, Instruction manual and Wireless network adapter. $79.79 & eligible for FREE Super Saver Shipping.